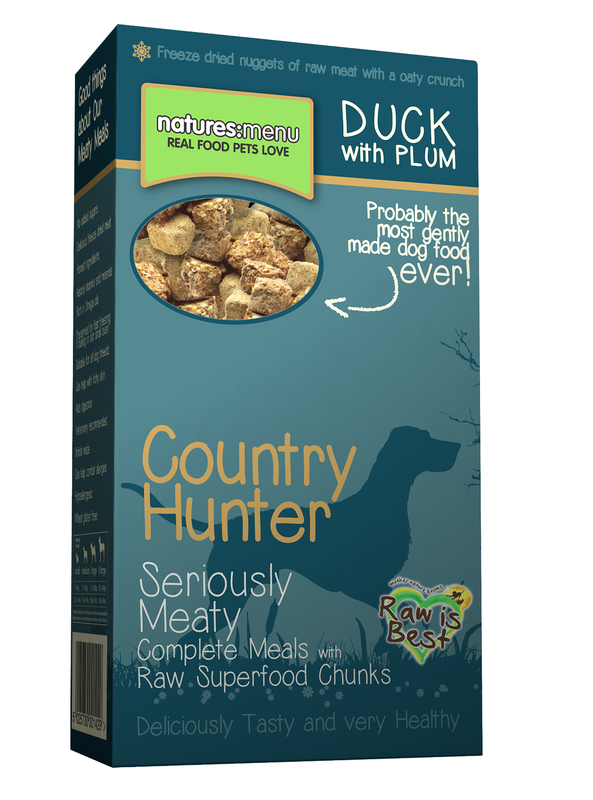 Country Hunter Freeze Dried Seriously Meaty Crunch Duck & Plum from Natures Menu contains only the best ingredients which are all gently freeze dried into what could be the most natural dry dog food available. To complement the tasty meaty nuggets each recipe also includes a concoction of easily digestible baked oats, vegetables and fruits, all which have been baked into crunchy nuggets. To make the meal even more digestible why not add a bit of water to moisten the nuggets. Each recipe also contains added B Vitamins, Manganese, Calcium and further minerals to support your dog's health. Duck is a highly nutritious meat with a mineral content consisting of Selenium, Zinc, Copper, Iron, Calcium and Phosphorus. As well as being tasty, plum has the added values of Beta Carotene and Vitamins A, C and K.
Calorie content - 109kcal per 100g. Duck (60%), Peas (10%), Swede (10%), Carrots (7%), Apples (5%), Plum (4%), Seaweed (1%), Spinach (1%), Yucca Extract, Green Tea Extract, Grape Seed Extract, Yeast Extract, Dicalcium Phosphate, Calcium Carbonate. Below are some recent questions we've received regarding Natures Menu Country Hunter Freeze Dried Duck & Plum Dog Food, including answers from our team. Is this the same as the raw equivalent? My dog eats your raw grain free nuggets, I am wondering if this is the same as any other food makes him sick and it would be really handy when we take him on Holliday. The closest product to feeding the Natures Menu Country Hunter Nuggets is the Country Hunter Seriously Meaty Cans. These maintain the same 80:20 ratio of meat to fruit and vegetables, and is grain and gluten-free. If you'd prefer to feed a dry product, they also have Country Hunter Seriously Meaty Raw Superfood Chunks, which is their complete dry food and is available in three flavours. They contain oats as a source of carbohydrate, so if your dog is sensitive to oats, I'd recommend going with the canned variety instead!